1. China's great market opening? 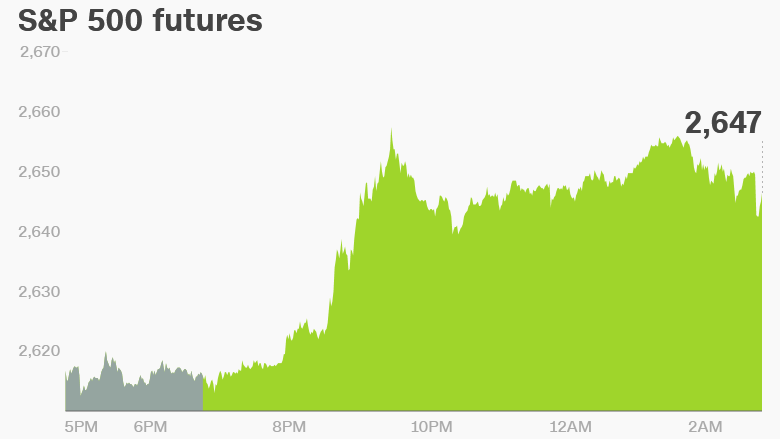 US stock futures were higher early after Chinese President Xi Jinping said his government would "significantly lower" tariffs on vehicle imports this year as part of efforts to further open its giant economy to the world. The pledge addresses one of the gripes of President Donald Trump, who has threatened to impose new tariffs on $150 billion of Chinese goods in a trade dispute between the world's two largest economies. Experts cautioned, though, that Xi's comments may not do much to resolve the conflict. The Chinese government had promised in November to "gradually and properly" reduce tariffs on imported vehicles, though it didn't give a specific time frame for doing so. Still, investors took Xi's pledge as a positive sign. "The lack of any ramping-up of the US/Chinese trade-war-by-rhetoric was the key for equities to rally," said Kit Juckes, a strategist at Societe Generale. 2. Facebook's reckoning: Facebook CEO Mark Zuckerberg will testify before a joint hearing of the Senate Judiciary and Commerce committees on Tuesday. Zuckerberg will go before the House Energy and Commerce Committee on Wednesday. The CEO had faced calls to testify in the aftermath of the Cambridge Analytica scandal, which raised concerns about how Facebook (FB) handles personal data. Facebook shares have declined 15% since the scandal erupted. 3. Oil prices jump: The latest spike in geopolitical tensions in the Middle East has pushed oil prices higher. The United States and Russia clashed over Syria on Tuesday, as Ambassador Nikki Haley told the United Nations the United States will respond to the Assad regime's alleged chemical attack against Syrian civilians. Investors fear that a wider conflict could break out in the region. US crude futures jumped 1.3% to trade at $64.20 per barrel. The price of Brent crude, the international benchmark, also rallied. 4. Global market overview: Major European and Asian markets were higher. Markets in Hong Kong and Shanghai were the biggest winners following President Xi's speech, finishing the session around 1.7% higher. The Dow Jones industrial average closed 0.2% higher on Monday, while the S&P 500 added 0.3% and the Nasdaq gained 0.5%. 5. Earnings and economics: The Bureau of Labor Statistics is set to release its March PPI report at 8:30 a.m. ET. It's Equal Pay Day in the United States. The day is a symbolic marker that reflects how long women have to work into the new year to match the pay earned by men in the previous calendar year.